In 2018, Dry July funds raised for Cancer Council WA will go towards our 13 11 20 cancer information and support line. Channel 9 news presenter Louise Momber knows firsthand how vital 13 11 20 is for WA families affected by cancer. Her mother Liz was diagnosed with breast cancer in 2004. After her chemotherapy, Louise thought her mum was in the clear, until she was diagnosed with multiple myeloma almost five years after the treatment. 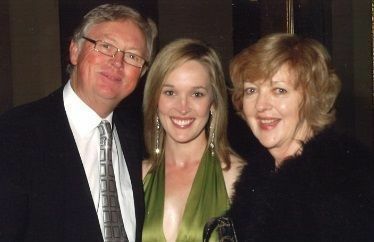 In 2011, Louise’s father Peter was diagnosed with colon cancer, with secondaries on his lungs and liver. Like many family members wanting to help their loved ones cope with hearing the news they have cancer, Louise wanted to give her parents the best support she could. Louise found her support through our 13 11 20 service- a confidential cancer information and support phone line run by our experienced Cancer Nurses. It’s available to those affected by or concerned about cancer and works to connect West Australians with relevant support, information and resources. For Louise, her family’s cancer journey lasted many years— and our 13 11 20 nurses were there to support her when she needed it most. Louise’s parents not only had different types of cancer, but their journeys and how they coped also varied greatly. It’s why having Cancer Council WA there to help her meant so much. By calling 13 11 20, Louise was able to ask the questions she thought might be distressing to ask her parents, and found her own vital source of knowledge and support during a very difficult time. In the last financial year 8,501 calls were received by Cancer Council WA cancer Nurses via 13 11 20. As a not-for-profit, non-government organisation we’re reliant on community donations to continue providing this much-needed service for the WA community.